Please verify your camera's lens thread size before ordering. 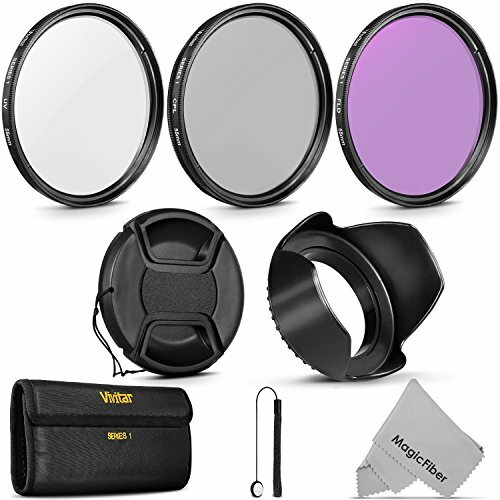 Included in this kit are 3 essential filters available for your camera kit. The UV, protects your lens against scratches, the CPL removes unwanted glare and reflections, and the FLD filter removes the greenish cast caused by fluorescent lights. Whether you are a beginner, advanced shooter, or whether you take stills or video, these affordable and highly useful filters help improve the image quality of the pictures you take. - A general protective lens that also help reduce or eliminate haze and the bluish cast caused by UV light. - Helps reduce reflections and glare from non-metallic surfaces. - Color correction filter designed to reduce the greenish cast from fluorescent lighting. - Screw-mount lens hood with locking ring. - Prevents glare and lens flare by blocking out stray light. - Professional tulip shape design to prevent vignetting. - Easy to use. Quickly attaches to the front of your camera lens. - Made of high impact plastic for extra durability. - Cap Keeper attaches to the front of lens cap preventing loss. Premium MagicFiber Microfiber Lens Cleaning Cloth included with your order. Quality optical filters for protection and image enhancement.